On Saturday, TJ issued an invitation irresistible to any new beekeeper: a hands-on demo of his spring hive inspection. Props to local woodworker, Bill H., for crafting this lovely little bee home. It’s a Kenyan Top Bar Hive with plenty of modifications designed by local bee sage, TJ. I’ve got a lot of old men looking out for me. My hive has arrived! I will post pictures soon. 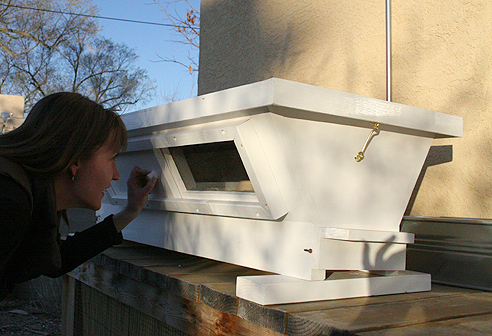 One of the most generous beeks in our local community examined his hives this weekend and found tragedy. It’s the sort of thing that drops your heart right through your feet, crashing like a pebble on the dirt below. Surely, you have sinned, my child. NM Beek did the brave thing and wrote about it. For a newbeek like myself, his experience and the naked telling of it are invaluable learning opportunities. 50 lashes aside, nothing hones one’s skill like a few failures and a visit to the bee catacombs. Besides, he’s not the only one.